Vets and rookies alike combined to put Texas over San Jose tonight by a score of 5-3. The captain, Travis Morin, notched three points while rookie Denis Gurianov scored his first AHL goal, the eventual game winner. Morin's line was the story of the night as the return of Brendan Ranford to the lineup keyed the trio to an eight-point night. "We felt pretty good all night," said Morin of his line. "Stransky's been good this whole year. He's doing all the things you want a wing to do. With the way [Ranford] played, he should feel good playing that way, the way we need him to play." 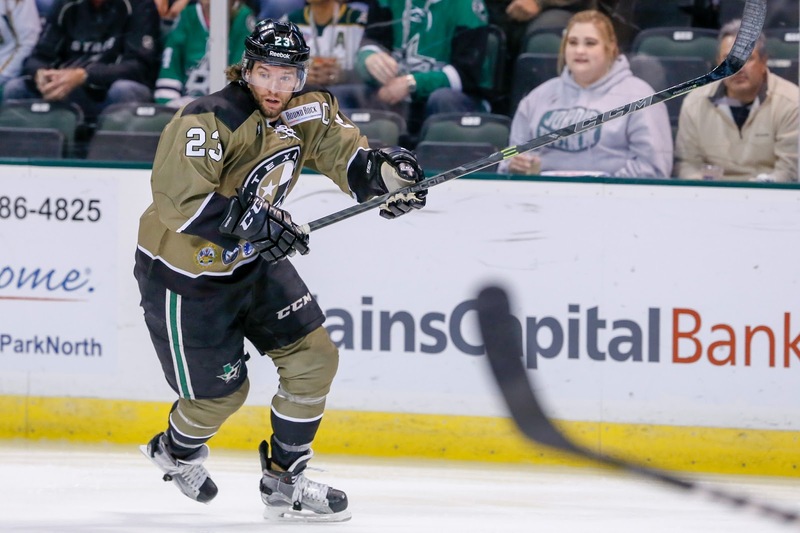 The return of Ranford to the lineup was an energy boost for the club, according to its coach, noting that he will only get sharper as the season progresses. After forty minutes, the Stars held a 2-1 lead on goals from Mike McMurtry and Mattias Backman. The third period broke out the scoring. "The third period opened up a bit," said Texas coach Derek Laxdal. "Both teams managed the game well early. The game got sloppy on both sides, but we did what we had to do to get a win. Getting a win in regulation time is huge." Morin noted that San Jose started taking some chances as the score started going against them, leading to more opportunities for his line. He noted, "There were a few plays where we chipped pucks out, they pinched and got caught on it." He scored a highlight reel goal to make it 3-1 early in the third period off a great saucer pass from Brendan Ranford. Morin completed the two-on-one play for his third of the season. His fourth would come later in the game. "Travis looked more like himself," said Laxdal. "He battled through injuries in training camp and it was good to have. We gave the guys [3 days off this week] and it's good to see them respond." Morin agreed, "I had an illness in training camp so I didn't get as much work as I would have liked. The first few games were a feeling out process. We've had some tough games on the road with tough travel, so it's a little more wearing on the old body than these young guys." Denis Gurianov notched his first AHL goal between Morin's pair of goals in the third. It was a quick play with Matt Mangene generating a turnover and dishing the Gurianov in the slot. "I felt great," said Gurianov on the goal. "I've been here three months now and I feel good. I'm so happy that we won." San Jose generated a push in the final period themselves, responding from a 4-1 deficit to cut the lead back to two twice. All of that came on the back on Barclay Goodrow, who scored all three of the Barracuda goals on the night. These two clubs face off again tomorrow in Cedar Park. Troock and Mangene swapped lines in the second.